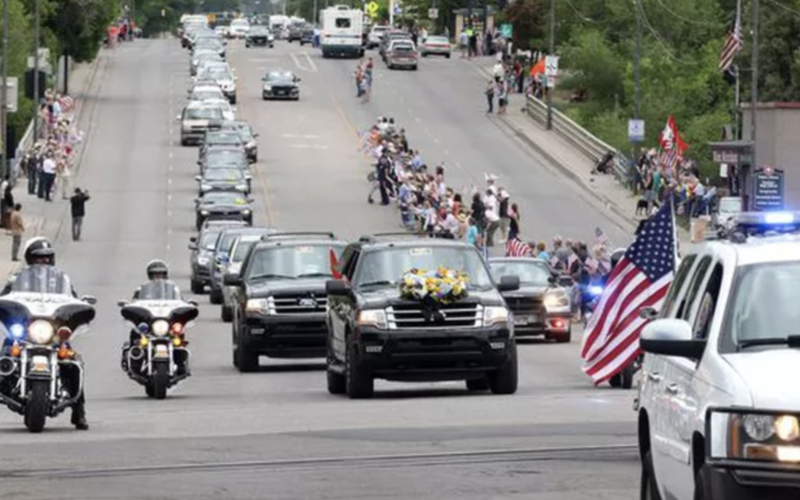 DURANGO, Colo. — People waving flags and standing at attention said goodbye Saturday to a Blue Angels pilot who was killed in a crash while practicing for an air show. The private service for Marine Capt. Jeff Kuss was capped by a 21-gun salute and a flyover by Marine units that he served with before joining the Blue Angels flight demonstration team nearly two years ago. Kuss was killed while practicing for an airshow near Nashville, Tennessee, on June 2. He is survived by his wife and two young children. Gov. John Hickenlooper ordered flags to be flown at half-staff to honor Kuss. Many of the people who turned out to honor Kuss went to at Fort Lewis College to watch the flyby, which included the Missing Man formation, in which one jet pulled away to honor him. Hickenlooper earlier praised Kuss for his Colorado values, the Durango Herald reported.